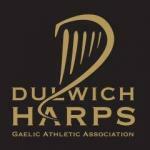 Dulwich Harps Ladies team made the trip to Goodmayes to play Thomas McCurtins last Saturday for their first-round league game. After what was a thrilling game the girls held on for a well-deserved win on a score line of 4-11 to 5-7. The club held their annual race night in The Herne Tavern last Saturday night. The event was a great success thanks to the efforts of the group involved in organising it. Thanks to Dave Draper for being MC on the night, The Herne Tavern for hosting the event and everyone who attended the event on the night a made it such a success. We would like to congratulate our long-standing secretary and all round good guy Alan Grogan on his engagement to Carol Duffy a few weeks ago. We wish you all the best with the wedding planning and all the best for the future. Both the Men’s and Women’s teams have made the move back to the Peckham Rye for training over the next few months. Ladies training will be on Monday and Wednesday nights at 19:00. If you are interested in joining please get in contact with Ursula on 07446 977 739. Men’s training is on Tuesday and Thursday at 19:00. If you are interested in getting involved, please contact Enda on 07522 723765. Please check us out on Facebook for further updates.